July 22, 2011, 2:45 p.m.
John Siracusa’s epic reviews of Mac OS X are just the right length for an ebook — and readers are willing to pay for it. By Andrew Phelps July 22, 2011, 2:45 p.m. It by now nearly qualifies as an ancient ritual in the tech world: Apple releases a new version of Mac OS X, and Ars Technica’s John Siracusa delivers a comprehensive, almost scriptural, review of it. A Siracusa review is meticulous, esoteric, thoughtful — and long. 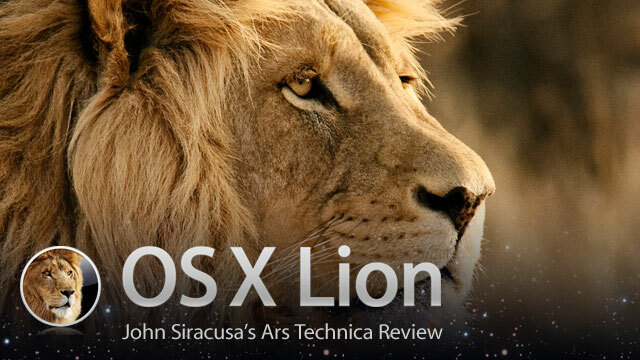 His appraisal of OS X 10.7 “Lion,” published Wednesday, weighs in at 27,300 words, split across 19 webpages. And in the tech-journalism world, as in the rest of the field, how best to monetize long-form work is a matter of some question. So this year, Ars Technica decided to also sell it as a $5 Kindle ebook. Ken Fisher, the founder and editor of Ars, is “pleasantly surprised” by the outcome. “It’s the same review that you get for free on Ars. You don’t have to pay for it,” Fisher said. But people have: The ebook sold 3,000 copies in the first 24 hours, Fisher said. That’s a fraction of the 3 million pageviews the review has seen on the web, but Fisher thinks of it as free money. Ars has sold alternate versions of long-form content for 10 years, but Fisher said he underestimated the power of Amazon’s one-click experience, which makes impulsive purchases painless. “I was surprised by how many people told us they read the review online and they just wanted their own copy to go back to. Or they just bought it as a tip-jar kind of thing,” Fisher said. Five dollars happens to be the same price as a monthly “Premier” subscription to Ars Technica, which disables advertising and makes Ars stories available in single-page versions and PDF format. That enticement appealed to some: Within 24 hours of running the Lion review, Ars had signed up 150 new members. (The total number of Premier subscribers is a “strong four-digit number,” Fisher said.) For the Lion review, Ars also offered subscribers versions in ePUB and Mobi formats for other ebook readers. Of course, there was still much grousing from people who think $5 is an outrageous price — an outrage! — for a review, but Fisher said most of the feedback has been positive. (“Only in today’s First World economies can people complain that they can’t get something for free that they can get for free,” he said.) Fisher was reluctant to put the price as high as five bucks at first, wanting to experiment with lower prices. But Amazon’s tiered royalty structure is designed to incentivize slightly higher prices; Ars’ revenue from a $4.99 ebook is roughly 10 times what it would make from a 99-cent ebook. The ebook is, ironically, absent from Apple’s own iBookstore. Because Ars could not publish the Lion review before Lion was released, as per Apple’s stringent non-disclosure agreement, Ars could not initiate Apple’s lengthy review process until it was too late. There are frustrating limitations to the Kindle format, Fisher said. The Kindle hardware does not handle graphics well, and screenshots play an important role in Siracusa reviews (while, for example, comparing the pixel heights of window buttons). Moreover, the authoring tools are crude. Reviews are designed for web first, print second, and the design does not translate easily to Kindle’s file format. Clint Ecker, Ars’ technical director, designed the book in, of all things, Pages, Apple’s word processor. Fisher said he is unlikely to make corrections and tweaks to the Kindle version unless it’s a serious error — for example, when Siracusa erroneously reported the number of registers in a CPU. (Yeah, I don’t know, either.) Meanwhile, the web version has already seen lots of small updates. Ars Technica actually made its first Kindle foray in March with “Unmasked,” a compilation of extraordinary stories about the hacking group Anonymous and its high-profile target, the security firm HBGary. That ebook, currently $1.99 at Amazon.com, has sold 1,000 copies, which Fisher considers a success. POSTED July 22, 2011, 2:45 p.m.
Phelps, Andrew. "Ars Technica tries a new way to monetize a much-anticipated article with a Kindle ebook for Mac fans." Nieman Journalism Lab. Nieman Foundation for Journalism at Harvard, 22 Jul. 2011. Web. 25 Apr. 2019. Phelps, Andrew. "Ars Technica tries a new way to monetize a much-anticipated article with a Kindle ebook for Mac fans." Nieman Journalism Lab. Last modified July 22, 2011. Accessed April 25, 2019. https://www.niemanlab.org/2011/07/ars-technica-cashes-in-on-the-siracusa-brand-and-word-count-with-a-kindle-edition-of-his-review/.